A year from today, the country will be waking up to find it has elected a new… what exactly? A new government? Perhaps. But I think it’s unlikely. I doubt any party will have notched up the magic figure of 326 seats by breakfast time. That’s the number they need to win to have an absolute majority in the House of Commons – in other words, a majority of one over all other parties. It may be that the figure of 326 isn’t reached until lunchtime, or even late afternoon. 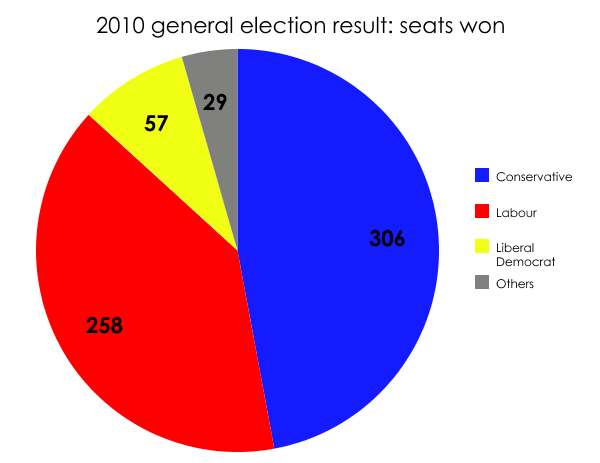 There are three possible outcomes to the 2015 election: a Conservative majority, a Labour majority, or another hung parliament. This would represent roughly a 2% swing from Labour to Conservative. If the 20 gains equated the Tories’ top 20 targets, among the victims would be the MP for Morley and Outwood: Labour shadow chancellor Ed Balls. The Lib Dems would lose five seats, including former health minister Paul Burstow in Sutton and Cheam, while Labour would lose a total of 15. My instinct is this is too big a task for the Tories to accomplish. For them to hold every single seat, then gain another 20, feels implausible. I’m sure they will, at the very least, lose half a dozen marginals to Labour – which means they’d have to win even more new seats. A swing of 5% would give them 326 seats and a majority of one, which in turn would reduce the Tories by 56 seats and the Lib Dems by eight. Tory employment minister Esther McVey (Wirral West) and financial secretary to the treasury Nicky Morgan (Loughborough) would be likely victims, as would Green MP Caroline Lucas (Brighton Pavilion), Lib Dem junior equalities minister Jo Swinson (Dunbartonshire East) and potentially three nationalists (Hywel Williams in Arfon and Jonathan Edwards in Carmathen East of Plaid Cymru, and the SNP’s Stewart Hosie in Dundee East). Does this feel likely to you? Not to me. Not at the moment, at any rate. Labour is up 34: half the number it would need for a proper majority. The Tories are down 26, the Lib Dems down five and others down three (one Green, one Plaid, one SNP). Intriguingly, both Labour and the Tories would – on paper – be able to form a government by going into coalition with the Lib Dems. A Labour-Lib Dem coalition would total 344 seats, a theoretical* majority of 18. A Tory-Lib Dem coalition would total 332, a theoretical* majority of six. Precedent should mean that Labour, with the greater number of seats, would get first “go” at forming a government. But might Nick Clegg decide he’d be better served by staying in a Tory coalition? Would Labour be able to do a deal with the Lib Dems only if Vince Cable was allowed to be chancellor instead of Ed Balls? And might we end up with a situation where the party with most seats isn’t the party with the most votes (which has happened before)? All mere speculation, of course. But that’s one thing I can definitely predict we’ll get plenty of between now and polling day. *Theoretical, because Sinn Fein never take its seats in the Commons.